Home » Safer Homes » Safer Bathrooms » Best Handheld Shower Heads for the Elderly: Long Hoses and Easy to Use! When elderly people begin having trouble with bathing, the first instinct is to find a shower chair or bath seat. These types of bathroom aids are important for elderly people for preventing falls. But there is another piece of bathroom safety equipment you should also consider: the shower head. Having the right shower head is important for reducing the chance of falls while in the shower. So, here is my guide on choosing the best handheld shower heads for elderly people and seniors who are having difficulty bathing safely. If you are in a hurry, here are my recommended hand held shower heads. Or, keep on scrolling to read my full buying guide or reviews on each of these models. Why is the Handheld Shower Head So Important? Let’s put ourselves in the bath slippers of an elderly person and think through the process of a seated shower. First, the bather turns on the water and sets the proper temperature. Then, the elderly person has to safely get over the edge of the tub. This is usually done by holding on to grip bars if the person walks ok. If not, transfer benches are used to get safely over the tub edge. Next, the bather sits on the bath seat to get ready to bathe. Or, if they used a transfer bench, they are already seated. Now, they adjust the shower head so that the water is hitting them properly. See the problem? To move the shower head, the elderly person must stand back up if it is mounted above them. On the other hand, they may have to lean forward to switch the control if they have the wrong style of handheld shower head. As a result, these movements are a fall waiting to happen! Handheld shower heads are an important part of the bathroom safety plan for many seniors. They also allow them to remain independent in their most private moments too. 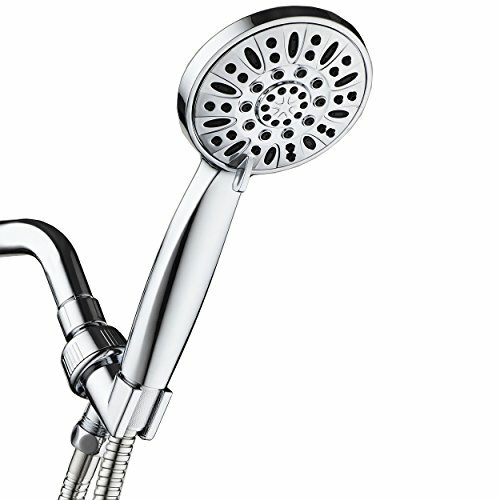 Here’s how to find the best handheld shower head for seniors and the elderly. The tubing is too short. Think about the size of a standard tub. The shower head needs to reach from the pipe at the top of the shower to where the bather is seated. More importantly, there should also be enough slack to allow free movement around to shower the entire body. The diverter is in the wrong place. The button that diverts the water to the handheld shower is often out of reach. It is usually where the shower head connects to the output pipe at the top of the shower. Tub spigot diverters are difficult for elderly to reach also without leaning. OK Then, What Should You Look For? To make the bathtub and shower as safe as possible for an elderly person, look for a handheld shower head that corrects the flaws above. Long Hose – I recommend one with at least 7 feet of hose to prevent leaning and excessive movement while showering. A shower head with long hoses will allow the senior to have a wide range of motion and movement without having to walk around too much and potentially slip. Kink-free Hose – The hose should not kink up and get tangled. This becomes a tripping hazard if it gets bunched up around the feet of an elderly person. Also, they bather may feel compelled to lean over and untangle it which will cause a fall. 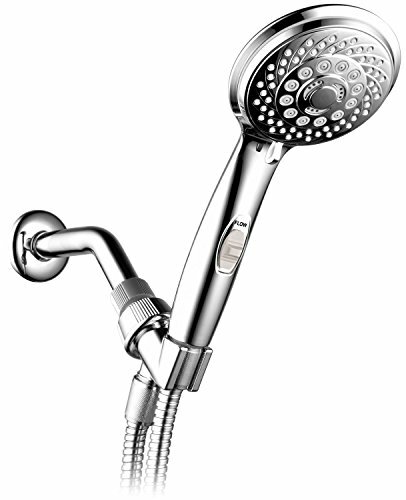 Easy Operation – Look for a diverter switch that is located on the shower head itself. Find one that is easy to push on and off. This is very important for seniors with arthritic hands. Handheld shower heads often cause joint pain for those folks. This also makes it easier to reach, instead of having to bend down in the tub to switch the operation. Variable Sprays – Since some elderly people have sensitive, thin skin. Harsher water pressure can be very painful, and even crack the skin. Controlling how hard the water sprays is very beneficial for elderly folks because they can get a gentler stream out of it. Lightweight – Lightweight hand held shower heads are the best kind for older people. This goes back to the sensitive arthritic hands issue. Plastic shower heads are usually lighter, so opt for those instead of heavier metal ones. This is the best choice for a general handheld shower head for an elderly person because it checks off every box on my list and is affordable too. I love that it has an on/off switch control at the base of the handle for easy access, and it's operated by a simple rotating motion. It also has 80 inches of kink and tangle free tubing to prevent any potential falls, and only weighs a little over a pound. While this seems like a lot, it should be light enough for people with arthritis to handle. The whole unit is corrosion resistant as well. Finally, it has 3 spray head patterns for adjustable and customizable water pressure to protect seniors' sensitive skin. With tool free assembly and a simple white design, this shower head is easy to set up in any bathroom. 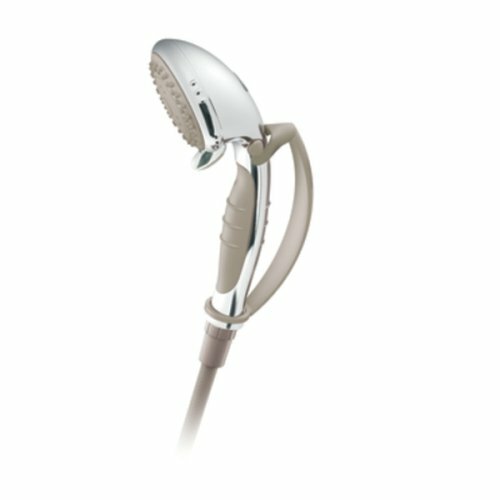 This is the best handheld shower head with a long hose for people with arthritis. The grip is soft and textured so that it is easy to hold onto without needing to squeeze it. It also has a built-on strap that keeps the elderly person from dropping it. This could prevent a fall! It has a long 84 inch hose (which comes out to about 7 feet) for maximum movement without any tangles or kinks. The on/off switch is easy to reach, located on the head itself, and easy to use with just a one touch operation. It weighs about 1.6 pounds, so it's a little heavier than the other option but still light enough for arthritic hands to handle effectively and without pain. EXTANDABLE SHOWER HOSE: More flexible than stiff plastic hoses 2 ft longer reach then standard length hoses More compact and less tangle then extra-long hoses Super flexible spiral design Rich high-end look Stainless Steel Hose and Nuts Stretches to Your Needs! I like this handheld shower head too but it has a few small issues. It is best used for a high functioning senior with good hand function. The on/off switch is located in the right place but it is small in size. Even better, the tubing stretches to 7 feet long (from 5 feet) but this could be difficult for an elderly person who is weak. Also, the motion needed to stretch could potentially knock them off balance too. On the other hand, it does have a large amount of pressure settings (7 to be exact) and only weighs one pound. You can also install it easily without any tools, which is very handy for a senior living alone. INCLUDES: Handheld Shower Shower Hose Overhead Bracket Washers Plumber's Tape Installation Manual and Warranty. STUNNING GIFT BOX DESIGNED IN USA: Sophisticated, upscale packaging for a perfect gift. EASY TOOL-FREE CONNECTION: No need to call a plumber - installs in minutes with just one hand-tighten connection. Fits any standard shower arm. BEST LIFETIME WARRANTY: Hassle-Free US Limited Lifetime Warranty with LIVE customer service representatives in US. Another great shower head that's a bit wider than the others on this recommended list is the Aquadance high pressure shower head. Its head it about 4 inches wide for a full shower experience. It also has 6 settings including power rain, pulsating massage, power mist, rain massage, rain mist, and pause mode with an easy to turn click lever dial. Due to these features, this shower is versatile and easy to operate. This one can also be used as a hands-free overhead mounted shower head with an easy to adjust angle for shorter or taller seniors. It has a flexible, reinforced 5 foot long stainless steel hose, and it has rub clean jets that allow for easy cleaning and no lime buildup. Of course, many of these shower heads are also helpful for handicapped adults to have in their bathrooms. They’re also great to use in conjunction with other bathroom aid products like non-slip bath mats, shower chairs, hand rails, and more. Bathing can be a dangerous experience as we get older, so having any sort of help in the shower is recommended. Below are a few more shower heads that are specifically made for handicapped adults. Take a look and see if one would work for you. Fits on all standard shower plumbing / Free Teflon tape included.Please kindly note that because the water pressure in each family is different, the water pressure or size of water column of the Shower Head is different also. This this is normal and reasonable. Limited 3 Year Warranty is provided by Lordear.This warranty is void if the product has been purchased from an unauthorized distributor. The main advantage of this shower head is that its face is much larger than others on this list, coming in at 6 inches wide. That kind of dispersion provides a very luxurious experience for the user, and also speeds up the process of cleaning a bit. 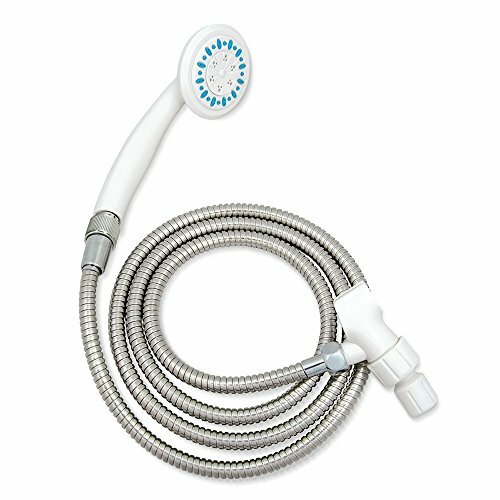 This is particularly beneficial for caretakers who have to bathe their elderly patients, as it's more comprehensive than other shower heads. It also has a whopping 8 spray settings for personalized water flow and a lot of versatility. With a flexible 60 inches of stainless steel hose and a 2 way diverter switch, this checks off all the boxes. 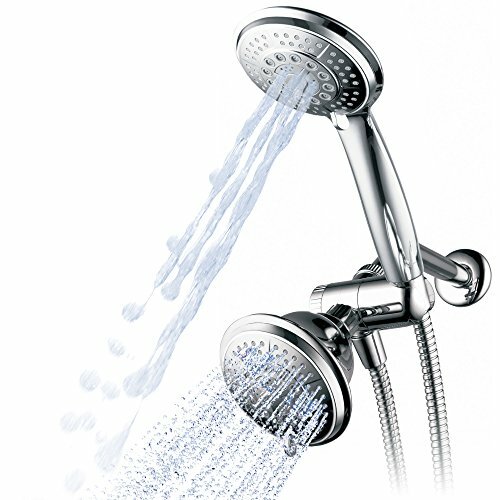 Most notably, this shower head fits all standard shower plumbing, and your purchase includes free Teflon tape as well. The primary drawback to this product is that you may have to get professional installation if you want to make sure it's done right. Finally, you may find it beneficial to get a 2 in 1 shower head/ handheld shower head combination product like this one. Here the advantage is that you get two streams of water to make sure you're entirely clean, but you get the independence and control of the handheld shower head along with the feel of a normal one. This shower head comes with 5 flow settings, including wide rain, power massage, stay warm mist, eco rain, and pause mode. It also has the option to only spray the stationary shower head or handheld component if you don't want two streams at once. Furthermore, the chrome face of this shower head is 4 inches wide, which is broader than usual. Most notably, the Hydroluxe also features a 3 zone click lever dial, which is easy enough for senior hands to operate, and a patented 3 way diverter dial for the various settings of the shower heads. The overhead bracket that holds the two shower heads is also adjustable to any angle, and there is a 5 foot long flexible stainless steel hose. You can install this in a senior's home tool free, especially since your purchase comes with plumbers tape, but there is also an option to add in professional installation. 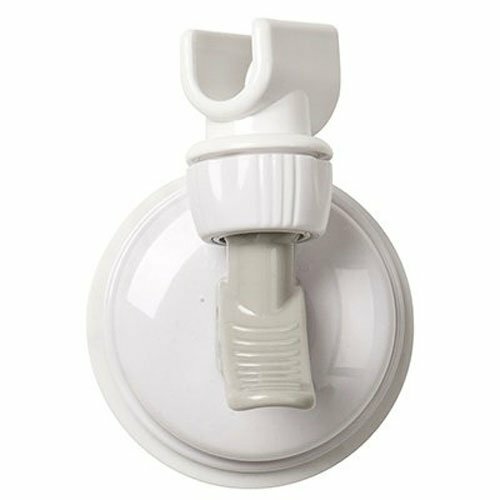 This product is a great way to mount the shower head in a safe location for the elderly person. It uses a suction system to mount the shower head anywhere in the shower. Mount it in a place where they will not have to stretch or bend over to get to the shower head. As a result, the shower head will be close at all times and maybe prevent an injury. There are a few drawbacks, however. This product does not suction to drywall and only works when it is applied to smooth, dry, non-porous surfaces. If your shower is like most others (glazed ceramic tiles, plastic, or glass surfaces), this shouldn't be an issue. When placing the suction cup on tile, the tile square needs to be at least 4 inches by 4 inches in area to work properly. If it is placed over grout lines, this allows air to move underneath the suction and compromise its hold on the tile. However, the good news is that it can be relocated easily, so make sure to test it in a few different areas to make sure its secure and comfortable for continued use in your seniors' shower. Having the right handheld shower head for elderly people and seniors is important because it makes a big difference in their safety. These simple little products go a long way in reducing the chance of a fall in the bath or shower due to their convenience and easy to operate features. But, there are a few critical features they should have to be safe. Whether they are being used in a standard tub or a walk in tub, choosing the best shower heads will leave seniors clean and safe. What has been your experience with elderly bathroom safety? 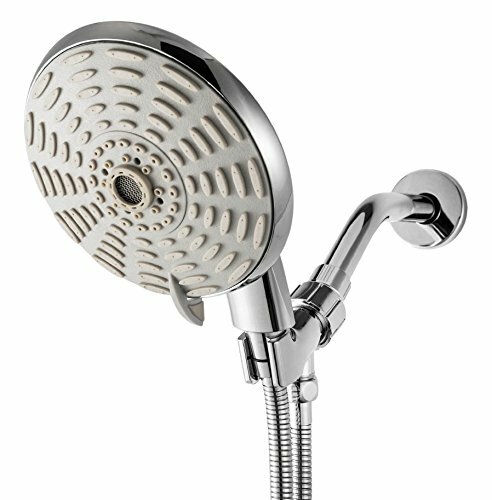 Do you use a particularly great shower head that’s not mentioned above? Please share below!